Busy responding to emails? When do you do your work? Yes I am serious. That is the simplest best practice you can follow in order to manage Outlook better. When you send a mail – you are doing your work. When you reply to others mails – you are helping them do their work. Agreed? Similarly, if you attend a meeting called for by others – you are helping them get their job done. Now to be fair – you should do your work first and then help others do theirs. Right? So the number of mails you send must be more than the number of mails you reply to. The same concept goes with meetings. … that is not so. The ratio is always against you. 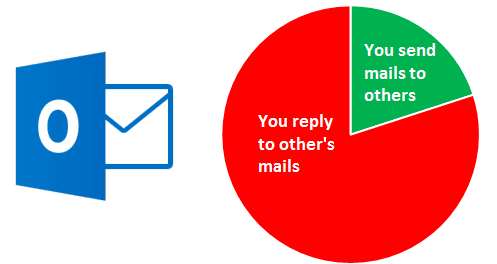 That is why we waste so much time responding to emails in Outlook and there is no outcome at the end of it. Just take a look at your Inbox and see how many unread emails you have? How many meetings you must attend in the next 5 days? It is no wonder that many people brag about aving cleared all their mails. Having zero unread email has become a rare achievement in the modern workplace itself. You wasted time but did the other people benefit? Not really. Because from their point of view also the same imbalance exists! You spend so much time helping others that your own work (KRA, Responsibilities, Dashboard) suffers. You are capable of doing everything you have signed up for. But you simply don’t have the time. Don’t blame Outlook. In fact, Outlook has a perfect solution for these issues. It is just that we have never utilized Outlook to our advantage. In the next article, I will give you a simple and practical way of handling this modern day dilemma called email management. Till tomorrow, I will give you a hint. Look at all the folders in Outlook and see which one is fully under your control.